We look forward to seeing you at Reunion for New Alumni 2019. This page should provide all the information you need to plan your day and answer any questions that may come up while you are at the School. If you have any further questions, please do not hesitate to contact us at reunion@london.edu or call +44 (0)20 7000 7247. The day programme will be on London Business School campus and the after party will be hosted at Skylon. We will be photographing and filming activities on campus and at the after party. These images will be used to publicise R4NA in print publications and on the School's website. If you do not wish to be featured, please alert the photographer or film crew. We will be tweeting throughout Reunion for New Alumni. To join in, please use the hashtag #R4NA to tweet or search for tweets. You can follow the School @LBS and our Alumni twitter feed @LBS_Alumni. Just in case you have already forgotten, this online map will help you find your way around campus. Additionally, see below for information about on campus facilities and amenities, and relevant contact and taxi company phone numbers. Internet access Wireless internet is available on campus throughout the day. Your existing portal username and password will give you access to the Guestnet. wireless SSID. Please approach a member of staff if you require assistance. Computers with internet access are also on hand in the Alumni Centre. Alumni Centre and Library The Alumni Centre (consisting of a lounge area and a business centre with computer and printing facilities) and the Library in the Sammy Ofer Centre (SOC) are accessible 24 hours a day if you have an alumni card. Additionally, there is also second Alumni Centre in the Taunton Building. Alternatively, you can sign for a temporary alumni card at the SOC or Taunton Reception (you will need to bring some form of ID with you). The SOC and Taunton front desk are staffed 24 hours. All visitors (one per host) must be with a member of the School (student, staff or alumnus/a) at all times. Fitness Centre The School offers alumni free access to the fully equipped Fitness Centre at the Taunton Building, which is staffed between 08.00 and 20.00. The swimming pool is only accessible during these hours. ATM We now have an ATM located in Plowden reception. You can find additional ATMs near the Co-op. Gift Shop The Gift Shop is located next to Plowden reception and sells books and a wide variety of London Business School branded merchandise. The shop is open between 10.00–18.00. The Alumni Career Centre is excited to be taking part in Reunion for New Alumni. Meet with one of our expert career coaches while you're back on campus. They will help you clarify your career goals, plan an effective job search, review the steps to your next promotion or help you review your career to date and think about future options. Booking is essential - please book here to reserve your session. 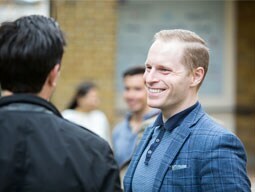 London Business School alumni remain part of our extended family for life. Reunion for New Alumni is just one of the many ways you can stay connected to the school. To find out about the different ways you can continue to be involved, visit Portal > Stay involved. To learn more about the services and benefits available to you as an alumnus/a visit Portal > Services and Benefits. For particular questions about the alumni community, please email alumnirelations@london.edu or call +44 (0)20 7000 7279. Celebrate all you experienced, accomplished and continue to achieve as part of the LBS community. As well as coming back, Reunion for New Alumni is an opportunity to honour your partnership with LBS and its future. You hold the power to make a real difference with your giving at any level – seizing these opportunities helps us ensure the best experience possible for our students, that our reputation remains strong and that we will always rank among the world’s top business schools. Every gift – no matter the size – is meaningful to LBS. Your participation is what matters most, and it ensures that your story as an LBS graduate continues to be a success. Make your R4NA gift today or for more information, please contact LBSFund@london.edu.